Hopkins Manufacturing Corporation makes your towing experience simpler and more rewarding through innovation and value, offering a variety of towing solutions including vehicle wiring kits, adapters, vehicle and trailer connectors, breakaway systems, and much more. Today, more than 40 percentage of retail category sales are generated from Hopkins innovations. As the number one brand in towing electrical products, Hopkins Towing Solutions has provided consumers with innovation, durability, and performance for over 20 years. Hopkins' Agility Proportional Brake Control is designed to control the braking power for safe and efficient braking. It features an LED light which indicates the power required for controlling the vehicle and the trailer. A digital display will make setting this brake control a snap, while five on-the-fly sensitivity settings allow for adjustment of trailer weights and weather at the press of a button. These connectors are designed for short-proof protection and can be operated at flexible angles. 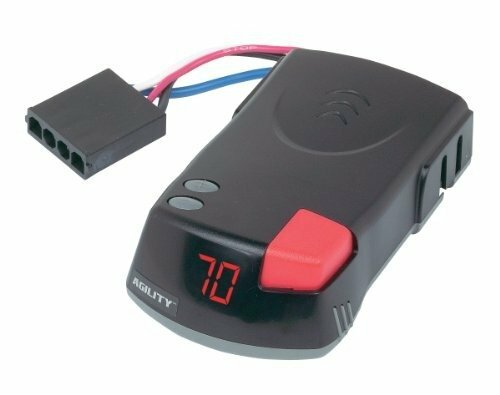 Most states and provinces require a trailer brake controller based on the weight of the trailer. This product requires and additional wiring harness for installation. Harness is sold separately and is vehicle specific.